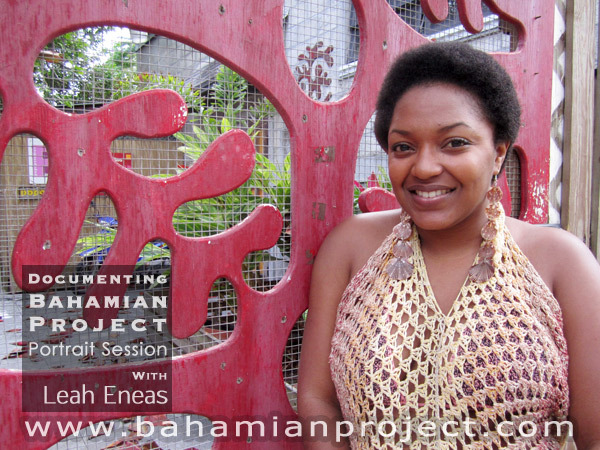 This picture of Leah Eneas was taken right after her portrait session for the Bahamian Project. The final portrait images will be unveiled at the Exhibition Opening at the National Art Gallery of The Bahamas on July 11, 2013. Leah is a true original. The widely talented young Bahamian singer, actress and radio personality made her on-stage debut at ten when she appeared in the musical ‘All My Chirren’, a Bahamian parody. Since then she has appeared in numerous prominent plays, productions and films including “Way of The Dolphin” – an American film directed by Michael Sellers. Her resume is a long and interesting read. Leah puts people at ease. With her you will find no pretenses, she is real, unusually honest and immediately familiar. Within minutes of meeting her you feel like longtime friends. She is smart, quick-witted and unabashedly unafraid to say what’s on her mind – No. Matter. What. Those qualities, along with her seductive slightly-raspy voice and quirky sense of humour, have made her a popular personality on the radio shows she has hosted. They have also made her a popular person. At this point in her life she says it is crocheting that has her hooked. Leah describes herself as a crochet artist… and now, a fashion designer, having launched her own crocheted clothing line in 2012 – under the name “Late Bloomers”. She arrived at our studio wearing a full-length, body-hugging, halter-style dress in earthy-pastel hues of yarn. It was one of her own creations and she called it her “mermaid dress” – an apt description. As with all her passions – singing, acting, dancing – crocheting was a skill she learned at a young age. Her grandmother, Muriel Eneas (“a legendary woman,” she sidenotes) taught her when she was nine years old, “in the summer of 1992 and I’ve been crocheting ever since,” said Leah. Having already conquered many frontiers, she says she now plans on becoming the master of the Crochet Yarniverse.